Food Costs > How Much Does Mahi Mahi Cost? How Much Does Mahi Mahi Cost? Commonly known as a dolphin or dolphinfish, the Mahi Mahi is a thick skinned fish with a unique, sweet flavor. The Mahi Mahi is commonly known to be found in the waters of states such as Hawaii. On average, Mahi Mahi can cost anywhere from $1.50 to $3.50 per pound if purchased as a frozen filet. If purchased fresh from a local fish market, the price can be anywhere from $7 to $13 per pound, already prepped and cut. The cost typically depends on the size of the fish, the geographical location and who you purchase it from. This fish will be in season during January and February. WildOceanSeaFoods.com has a few packages such as the “5lbs Mahi Mahi Boneless Fillets” which costs around $75. They also have the 10-pound package which costs around $150. AlwaysFreshFish.com in New Jersey has fresh Mahi Mahi that varies from $10 to $15 a pound. If you purchase the fillet, the fish market should have it prepped for you already. It should be packaged and sealed to retain its freshness. Much of the fish you find online will come from either Hawaii or Latin America. Mahi mahi should be available year round at most fisheries and can be sold as the following types: skin-on filets, frozen, skin-on and skinless boneless. This fish is low in saturated fat and an excellent source of B6 and B12 vitamins. The mahi mahi taste is known to be sweet with a firm texture. Purchasing the fish online may incur higher prices since it has to be shipped to your home within a day. If purchasing during a high demand season, the price per pound can raise by two or even three times the amount. When picking a filet, pay close attention to the bright skin colors. A good filet will have a firm touch and a pinkish color. 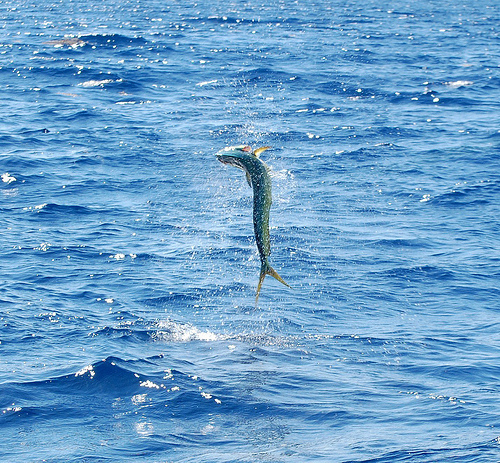 Popular places to catch Mahi Mahi includes South-East Asia, Spain, Australia and South America. Common places to find them in the water while fishing include debris such as floating logs, buoys and even near bait fish. A popular technique to find bait fish is to look for birds feeding on them near the surface. The average catch can be anywhere between 15 and 30 pounds. Anything over the 40-pound mark is considered to be above average. Mahi mahi can be baked, broiled, fried, grilled or saute. If baking, it can be an easy process. Simply rinse the fish, throw it in a baking dish and squeeze a bit of lemon juice on the top. In a separate bowl, mix mayonnaise, chopped onions and spread it on the fish. Top it off with some breadcrumbs, garlic salt and cracked pepper. Baked for 25 minutes at 425 degrees until its a nice golden brown. Purchase from a local fish market or a grocery store. Prices on the Internet tend to be higher than if you were to purchase it fresh locally. If you want to save money, consider purchasing frozen filets. While the taste won’t be comparable to a fresh fish, it can save up to 60% on the total purchase. If you have the time, consider going on a charter to catch the fish. Many charters will even clean up the fish after it has been caught. In fact, there are also restaurants out there that will cook the fish fresh for you if you bring it to them direct.